Yes, it is possible to paint over wallpaper and I have done it myself in three rooms in my home. First, let me say if you can remove the wallpaper without too much work, then do, but for that very stubborn paper you can paint over it and I will share the steps to get that smooth look and no one will know you painted over it. This is the before shot of the guest bathroom that recently got a makeover. Yep, it was time for the plaid wallpaper to go away. I knew I wanted part of the walls covered in beadboard so that made the job a bit easier with less wall to prep for paint. First step is to check for any loose paper and glue that down. You can use regular glue or wallpaper paste. We have used both in the past. This paper didn't have any loose pieces. even after nineteen years. Get some joint compound and spread it on every seam and let that dry. You are wanting to make the walls smooth and seamless. Painting over the seams without this step is a dead giveaway that you painted over wallpaper. After the joint compound is dry sand it until it blends evenly with the wall. In a bright area under a light fixture be sure the finish is perfectly smooth because every imperfection will show up. You may have to apply the joint compound again in some places. We had a few pitted spots that had to be done again. Just repeat the two steps above of applying the joint compound and sanding. Net step is to paint with OIL BASED PRIMER. Yes, oil based not water. The oil based will add a protective coating over the paper. Water will be absorbed by the paper and can become loose and wrinkly. This will show badly through your painted finish. So use oil based. 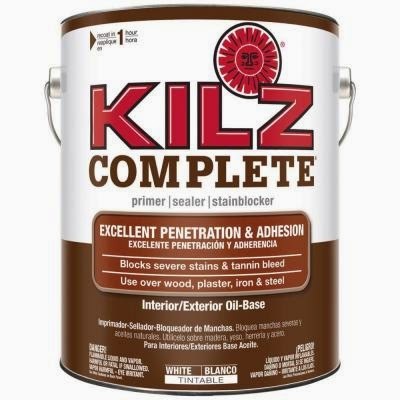 We used Oil Based Kilz. This is what the can looks like. Here is the paper covered with primer. Then I painted two coats of Latex paint in Revere Pewter by Benjamin Moore. We had a couple of challenging spots over the bathroom door. After using the joint compound and primer we still had a couple of stubborn seams showing up. I told hubby about it and he just worked on it again with the joint compound until we had a perfectly smooth wall. 1. Glue down any loose paper. 2. Apply joint compound to every seam. 3. After the joint compound is dry sand to a smooth finish and wipe away all dust. 4. Prime with an OIL BASE primer. Do Not use a latex primer. 5. Paint with latex paint and then check for any imperfections and work on those a bit more and paint again. The guest bath reveal is coming soon! Post edit: See the reveal HERE. Awesome tips! I won't even tell you how long it took me to take paper down in one room of my house and the walls still don't look smooth. This would have been sooooo much easier and a lot less of a headache! I don't have any wallpaper in the house but this is a great tip! I may have to try this at my moms! Super tips and great tutorial. Can't wait to see the bathroom. Great tutorial! Yes this saves a lot of time for sure. Stripping paper is not easy this is a perfect solution! Great tutorial....When my son sold his first home the wallpaper was not applied properly and was literally taking off the first layer of drywall...so we did the same thing...primed, compounded and painted...a great solution....The bathroom is looking great!! !...can't wait to see it all done!! !....Happy Monday!!! Great tutorial, Kim. I never thought to cover the seams! What a great post! I want to paint a border of wallpaper and you make it sound easy! Hummm, maybe not! Like your tutorial, really a good one. Oh KIM! This is like an answer to prayer! I have a couple of places in my house with wall paper and I cannot stand to remove it! I'm going to do this FOR SURE!!!! Thank you! Pinning and featuring it on fb! Kim, what a great tutorial! I had wallpaper in the bathroom in my previous home and removing it was a nightmare. Parts of the drywall came off with the wallpaper. I ended up needing to hire someone to fix all the walls of the entire bathroom when I was done removing the wallpaper. That's pretty neat! Not sure I would have ever thought of that. Great job! Great tutorial! Our best friends moved into a 100 year old house back when we were young. My hubby helped them remove like 6 layers of paintt and wallpaper. It was a nightmare!!! Wish we had known this then! Can't wait to see your bathroom reveal! We are currently doing this same process in our master bedroom renovation! This is awesome- I wish this tutorial had been around a few years ago when we moved into our first home- my husband absolutely hated his life dealing with that wallpaper! Thanks for sharing! This is just what I needed to know for my entryway. The paper is in excellent condition, just dated. The person who put it up used paste so I know it will be a bear to remove. Not a big area so this will work beautifully. Thanks for the great tutorial. I stripped wallpaper in this house and it was a nasty and messy job. But that was pre-kids. I don't think I would do it again. Where is the AFTER shot? My family just got a new house, and it has a room with dark brown wallpaper. Do you think it is possible for me to have white paint over it? And does it matter what kind of wallpaper it is to be painted over? If you follow these steps you should be able to. If the paper is loose I would remove it instead of painting over it. We knew ours was glued down well. Am wanting to paint over some wallpaper in are small bathroom. .am glad I read this because I don't know what kind of glue they used. .it maybe that it's over 30 years too...am ready for a change. .. I am wanting to paint over wallpaper but leave the border up. Is it possible to just put painters tape over that and paint the wallpaper below?